Now that my husband is almost 100% on the same page as me when it comes to what we’re going to do with Norton’s nursery furniture (it’s lifetime furniture; it’s Norton’s furniture for a lifetime), we’re working on what to do for newborn nursery furniture for new kid. I’m twenty weeks pregnant now, so this seems like a pretty crucial thing… particularly since the husband would procrastinate on this until I’m crowning and I’d have ordered something at the beginning of the second trimester. 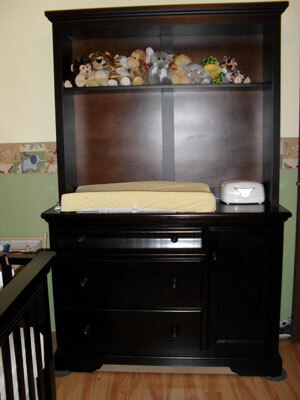 I’ve decided that there is exactly one piece of furniture that will come out of Norton’s nursery: the tall five drawer dresser. When Norton was tiny, it was slammed full. Receiving blankets, clothes for the future, bedding, whatever other things it occurred to me to stash in there for him… It was a pretty safe place to put things; Norton wasn’t mobile, so it’s not like he could get anything out. The only thing that’s in there now is Norton’s extra bedding. I hang the majority of Norton’s clothes up, so no need for the second dresser. 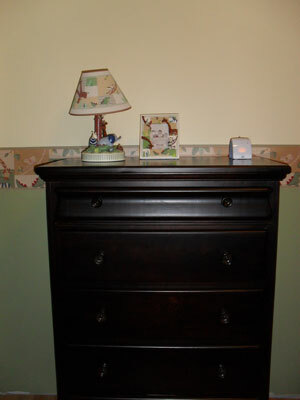 Granted, deciding to move that dresser comes with a few other challenges… but, hey, we’ll figure it all out. 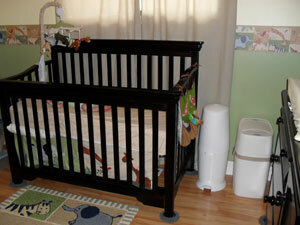 Here’s a few pictures of Norton’s nursery.